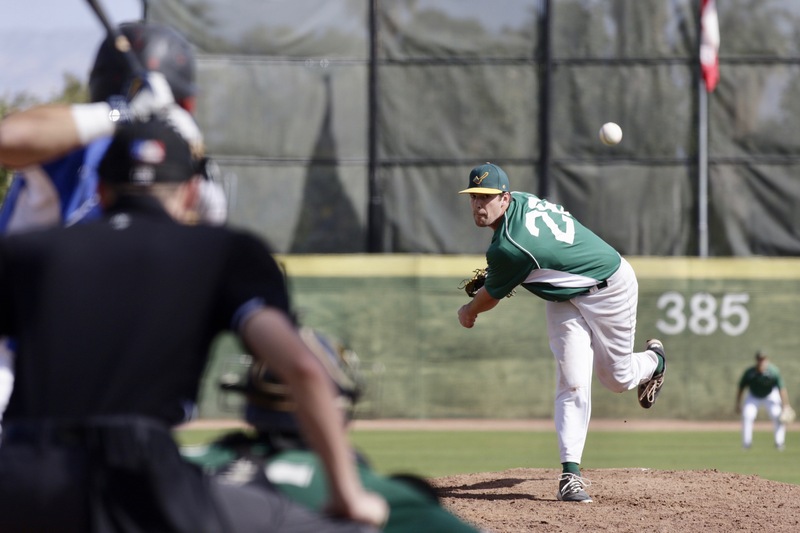 PALM SPRINGS, Calif. – A combined six runs scored by the Oregon LumberJacks in the third and fourth innings propelled them over the Washington Blue Sox in a 7-5 win on Monday at Palm Springs Stadium. The Blue Sox (9-6) opened the scoring in the top of the first when KC Huth tripled to lead off the ballgame and later scored on a Cody den Beste RBI groundout. With two outs and a runner on, Kailer Smith doubled home Marc Culmer to give Washington an early 2-0 lead. The LumberJacks (9-5-1) responded in the third with four runs all scoring with two outs. Aaron Endres walked with the bases loaded to score Jordan Hill to cut the deficit to one. Then, Chandler Rodriguez poked a two-RBI single to right that scored Brandon Moss and Jovan Hernandez. Brett Smith capped the scoring with a single to score Endres and the Jacks took a 4-2 lead into the fourth. Hill began the inning with a walk for Oregon and moved to third on a Moss groundball that trickled into centerfield. Hill would score on a wild pitch, and Moss eventually scored on a Jacob Wark single to go up 6-2. Down 7-2, Washington managed to push across three runs in the seventh with two coming on a double by Kailer Smith. However, Zach Compton, who represented the tying run, struck out to end the contest. Sam Burton (3-2) got the win after two innings of scoreless relief. Jake Moore (3-1) took the loss after allowing four runs in three innings pitched. Mike Castellani (1) recorded the save after allowing two earned runs over the final three frames. 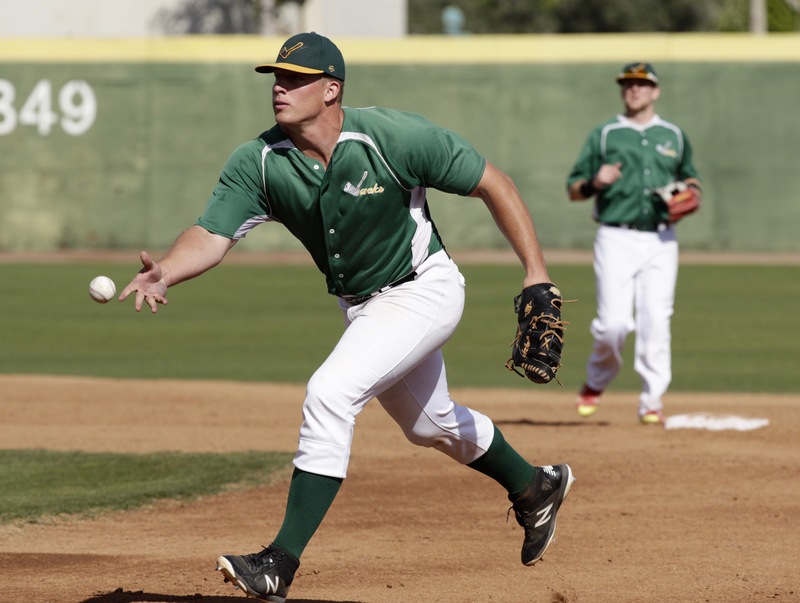 Moss reached base in all four of his plate appearances and scored three runs for the Jacks. Smith finished 3-for-4 with two doubles and two RBI for Washington. The Palm Springs Power picked up a win in the afternoon game over the Coachella Valley Snowbirds, 9-2. The Power (9-4-1) jumped out to an early 1-0 lead in the top of the first after their first three batters reached on hits. Caleb Lindsey hit a line drive RBI double to right-center field in the inning, scoring Jake Willsey. Then in the third inning, the Power scored two more runs, with one coming home on a passed ball and the other scoring on Scott Hilpert’s sacrifice fly to center field. The Snowbirds (3-11-1) got a run back in the third when Taichi Nakamura hit an RBI single scoring Yueh-Se Chen. The game turned into a blowout in the sixth when the Power exploded for six runs on four hits and three walks. Stefano Belmonte’s two-RBI double followed by Dillon Kelley’s two-RBI single were the big hits in the inning in which 10 batters came to the plate for Palm Springs. Down 9-1 in the seventh, the Snowbirds started the inning with three straight singles, including Kuo-Chen Tseng’s RBI single, but a double play killed the rally and the Power closed it out. Huai-Pin Chang started for the Snowbirds and looked good throughout his five innings, but he ended up with the loss. Steven Baker started for the Power and got the win after two scoreless innings. The Power own a one-game lead over the Washington Blue Sox for first place in the American division heading into the final day of the CWL regular season tomorrow. Meanwhile, the Snowbirds lost for the first time in five games, as they came into the game 3-0-1 in their previous four games. The Toronto Rush (8-6) scored runs in each of the final six innings to route the Canada A’s (8-6), 12-2 in game one on the auxiliary field. Connor Hoffman and Jon Bannister each homered for the Rush. Mason Schoettlin had a big day at the plate as well, three hits, including a double and three RBI. Tanner Klein, to his credit, had three hits and two runs scored for Toronto. In game two, the Manitoba North Stars (9-5-1) outmatched the British Columbia Bombers (2-11-2), 8-1. 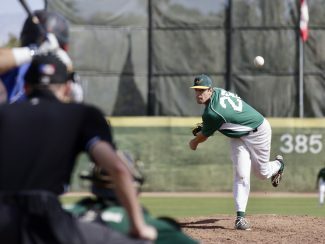 David Meade got the win after allowing one run over 4.2 innings pitched. Nicholas Lawrence sealed the deal for Manitoba with 2.1 scoreless innings of work. David Kerian shined for the North Stars at the plate, going 2-for-3 with a double, a home run, two RBI and two runs scored. Tuesday, February 13 is “2-for-Tuesday” at Palm Springs Stadium. One purchased ticket at regular price will admit two fans, and they can purchase hot dogs and soda for just $2 at the concession stand.